Warm, sweet, fun and tasty. The pride of Holland, and a real all-rounder. Stroopwafels, so familiar yet so exciting. Making them yourself is easier than you’d think, with our recipes for syrup, stroopwafels and syrup biscuits. If you want to, you can even prepare a complete stroopwafel menu. From appetisers to soups, and from main courses to desserts. Don’t feel like cooking? Why not try one of the sweet and sticky craft ideas, for a child’s party or even your own? Or follow us on our syrup journey, visiting stroopwafel bakers and experts in the Netherlands and far beyond, all the way from Brazil to South Africa. Get carried away by poems, short stories and witty trivia. 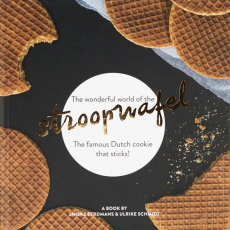 This book lays the wonderful world of the stroopwafel at your feet. A delicious book, sure to get your mouth watering in no time at all! Subtitel: The famous Dutch cookie that sticks!